Well folks, I’m excited to say I’ve heard from a few people around the Seattle area that are also interested in learning Lynda’s secrets to fitting! So far there are five of us! Since logistics will likely make it hard for us to take the class one lesson a week, I’ll likely break from tradition and watch all of the videos at once. I’ll figure out which lessons we should all be together to help fit each other, and then we’ll have a massive day of fitting! At least that’s how I hope it will work out now. We’ll see how things actually pan out when the time comes! And, if I can, I’ll still take you guys through the lessons slowly so that you can get a good feel for what the class is really like. 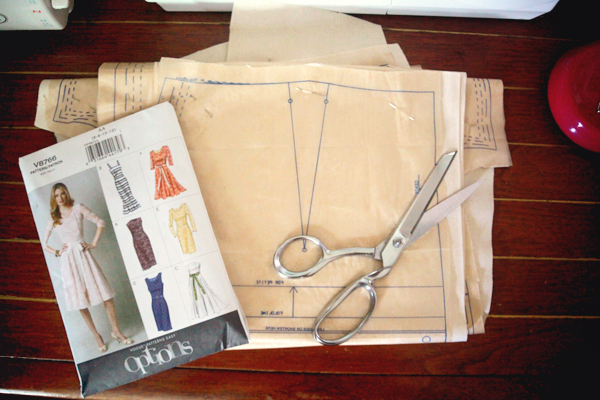 This week’s class was all about measuring, determining your pattern size, and cutting the muslin test garment. Lynda walked us through how to take our true measurements with the help of another person. Even though I now have a bunch of new Seattle fitting friends, I just used a mirror to make sure the tape measure was properly aligned. When I took my measurements back to the pattern, I found that I was between sizes. In this case Lynda suggests I choose my size through my bust measurement, which puts me at an 8. Next up was to cut out my size in the pattern. Lynda cut around her model’s size, adding a bit of extra seam allowance to help with fitting, but since I like to keep all sizes of a multi-sized pattern, I chose to cut loosely around each piece and will mark actual sewing and cutting lines next week when Lynda pulls out the wax tracing paper (I’ve already peeked at the beginning of next week’s class!). I’m still thinking about what fabric to use when I make this dress in the fashion fabric. I have both a crazy linen and a lace in mind right now. I think I’d get more use out of the former, but the latter would allow me to take advantage of the sleeve fitting lessons. Maybe I’ll just have to make two versions! I live just north of Seattle and I would love to be in on this! Am I too late? Now that you live on the Seattle area, you might want to contact Ryliss at the Sewing and Design school in Tacoma. Here: http://www.sewinganddesignschool.com/ I’ve taken classes with Kenneth King through her school. She has offered classes with Lynda as well. Lynda is a brilliant fitter, and couture teacher. She has an eye to getting a good fit, and also a fit that flatters. You’ll all do well learning from her!